Robin of Around the Island has a wonderful and informative post from 2007 about Hanukkah which began last night. Go over and take a look! The gazebo in the town square. Please visit all the other participants of RUBY TUESDAY. TO ALL MY FRIENDS IN THE BLOGOSPHERE! Thanks Mary for this beautiful meme. Thanks also for mentioning Hannukah today. It is very kind and considerate of you. What a beautiful gazebo, the decorations look so festive, and your poinsettia is a lovely rich shade of red too. Happy holidays to all celebrating this week, and thank you for the link to my Hannukah post Mary. The snowy bandstand decorated with Red stuff is fantastic! All the spirit of the holidays in it. I knew you would choose Originale! Yes you are, and funny. What a quaint gazebo - makes me wish I had decorated mine just a little bit more. I'm out of the blogosphere for a week or so to go visiting so let me wish you and your family a very Happy Holiday with many Blessings for the New Year! Your post is looking very festive, Mary! Great photos, Mary. Merry Christmas. Geez, I forgot to say, love the bandstand. Outstanding. I love the gazebo! This is a fun meme! Love all your photos. Have a very Merry Christmas and a Happy New Year! Beautiful poinsettias and gazebo, Teacher Mary. My entry's up. You must really love this time of year with all its redness! But it's not the only time of year for that! Thanks for hosting all these lovely Ruby Tuesdays and a merry Christmas! I can't see the first two pictures Mary, what a shame!! This happens a lot lately, and I don't know what causes it!! A merry merry Christmas to you and your family Mary! Hppy holidays to you and your family and thank you for the beautiful bookmarks. You're so festive today, Mary! Thanks for the smiles. Don't ya just love those PhotoShop filters? I don't know what I would do without them. Very nicely done. Happy holidays to everyone! Two more days to go... Have a merry, blissful and peaceful Christmas! Merry Christmas, Mary. And many thanks for this Tuesday treasure. that gazebo would be a perfect place to exchange vows. 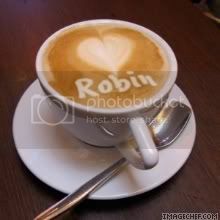 :-) Happy Tuesday! Happy Holidays to you, Teach Mary and to everybody. I love how you edited that poinsettia plant! Merry Christmas to Vincent and You!! :)MUAKS! Love all that red. Have a wonderful Tuesday everyone. You all get this up so fast…. Mine is up… and this time I have both food items AND something artistic-like. The gazebo is so picturesque. I hope you are enjoying the season and have a very happy new year. 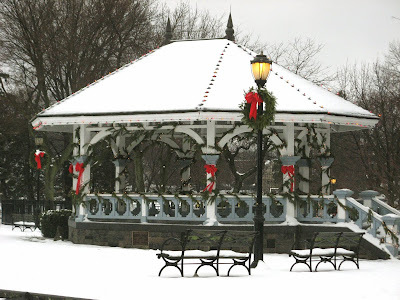 I love the poinsettias, but the red accents against the snowy gazebo are just beautiful! Beautiful poinsettias! And I love that gazebo. What a lovely addition to a town square. Hello Mary, what beautiful pictures you have posted today. Thought I would join you today. I made it to Ruby Tuesday today. I've been quite busy elsewhere. Oh, I love that gazebo! And I wish I knew how to photograph red flowers like that. My shots always turn out pinker than the real thing. Happy holidays to you, and to all! love the gazebo...i wonder what it'll look like without the snow. Poinsettias are a sure sign of Christmas!! Happy Holidays to you and your family!! Love that gazebo! It's so pretty all dressed up for the holidays. I love Poinsettia's. Yours are beautiful!! 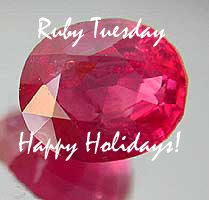 My Ruby Tuesday is posted. Hope you have a safe and happy holiday season!!! Happy Holidays, Mary. I'm so glad I found you and RT. I love it. You bring much happiness and delight to the blogging world! Our poinsettia back to full health! Ohhhhh that gazebo is so pretty! 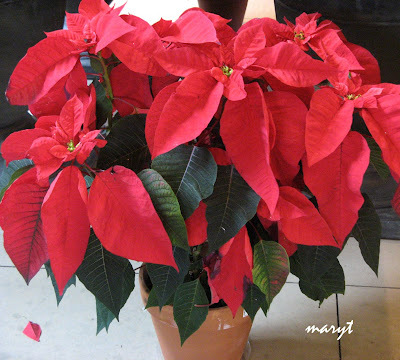 And I LOVE the poinsettias -- I just learned yesterday that they are NOT poisonous - and I CAN have them around my pets!!! I'd always heard they WERE poisonous... I'm sO happy! 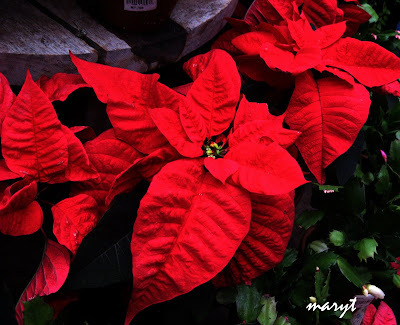 Poinsettias are just so pretty... and I like the red ones! Your Reds are splendid ! This is such a wonderful and beautiful time of the year. Thanks so much Mary for hosting this meme. This gazebo looks just lovely with the Christmas decoration ! I love the red flower. So Christmassy. Drop by anyone and happy Christmas to all of you! Lovely red poinsettias and decorated gazebo. Very festive. Hope your holidays are happy! i just love gazebos, dressed up or not:) here's my nutty entry! Love the gazebo shot. Looks similar to one we have here that I just photographed for our paper's blog. The poinsettia photo is lovely too. Thanks for this meme, as always, and I hope you and yours have a peaceful and happy Christmas. Love the gazebo shot. So pretty with the snow. Makes the red bows pop! :) Merry Christmas! Thank you for the creative impulse you have fostered in so many with your intriguing meme. Much joyfullness in the year to come. My preference is the first shot. It's a real slice of holiday life, with the Rubiness adding a sublime enhancement. I love the gazebo and the poinsettias. They all say Christmas so loudly. I hope that you don't mind that I swiped your picture! I have to now peel twenty pounds of potatoes because our whole family will be gathering at Betty and John's for Christmas eve and I have to make scalloped potatoes. Not participating this week, but I love the gazebo photo. I love how the ribbons POP with all that white around. Thanks for the loveliness, Mary. That gazebo is so cleanly composed, and so primary! And I love what you did in Photoshop - I'm gonna have to get that one of these days when I win the Lottery (which I don't play!) It looks wicked useful, and my photos need some serious help!